When I was younger the local supermarket had a noticeboard on which people could list items for sale, rooms for rent or services available. My local convenience shop has a noticeboard but it is behind the front door and I doubt that many people see it or even know that it is there. Of course I am a bit strange. 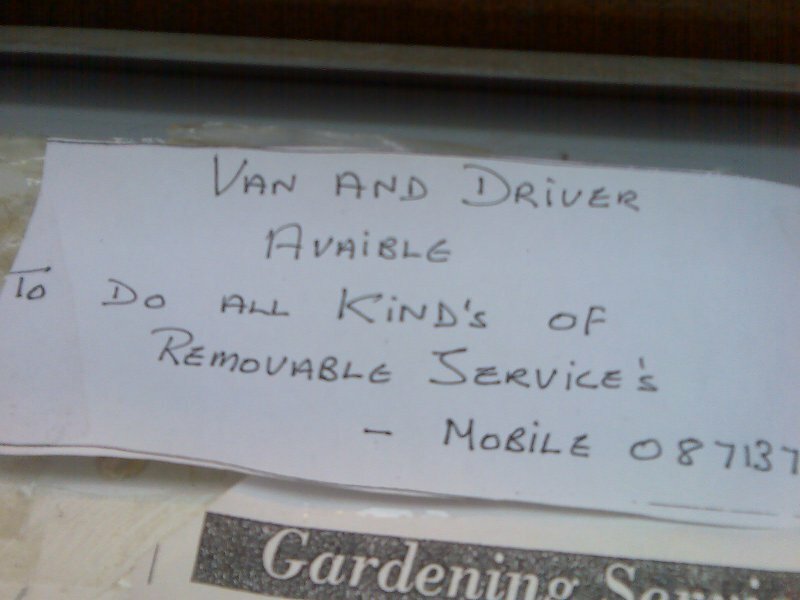 The van and driver ad caught my eye because it offended within 4 words – “Avaiable” is missing the “l” and should be “Available”. The apostrophes in “Kind’s” and “Service’s” are simply wrong. 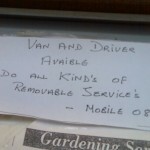 Maybe van driving is the advertiser’s speciality and not spelling. Or maybe s/he is actually very clever and made deliberate mistakes to stick in the reader’s mind. This approach worked, though my photography skills weren’t good enough to capture the entire phone number.